Rent The Regency Center - AEG Presents | Corporate Events | Wedding Locations, Event Spaces and Party Venues. Elegance. Versatility. Unforgettable Events. You have arrived at San Francisco's most architecturally stunning venue. Astonish your guests and host an event that will be remembered for years to come. Built in 1909, The Regency Center is considered the finest example of Scottish Rite temple architecture in the country, featuring Gothic, neoclassic, and Beaux-Arts styles. The building has housed a Masonic Temple, a dance studio, the Polish Arts Foundation, and a movie theater. Recently restored to its original splendor, this landmark offers three levels of unique gathering space. Upon arrival, an architectural icon, crafted from white Caen stone, will greet you. The interior features three distinct levels of event space, each boasting unique structural characteristics and an array of accompanying rooms. Each individual room possesses its own unique characteristics, and may be used separately or in combination. Marriage is a time-honored tradition - one that will last forever. Your wedding venue should be as timeless as the institution itself. Close your eyes and envision your special day. At a distinctive location, weddings are personalized events that are expressions of your individuality. The Regency Center exhibits unique characteristics to complement and enhance your occasion. But our captivating venue isn't just limited to hosting weddings. Ordinary events are made extraordinary when hosted in a setting that is elegant yet sophisticated. The Lodge is a dramatic crimson space and magnificent example of Gothic architecture. The Lodge features stunning thirty-five foot arched open beam ceilings with dark wood paneled walls and stained glass windows. Guests will be inspired by the astonishing thirty-one hand-painted backdrops that enhance the built-in stage and a fully-functioning 1909 Austin pipe organ. The desirability of this space is enhanced by the use of two elegant side rooms. The Lodge can seat 200 guests with a dance floor (included), 240 without, and 300 reception style. Social Hall SF and Annex has grey & gold colored walls, blonde hardwood floors, and beautifully arched and beamed ceilings make this room a memorable first impression. 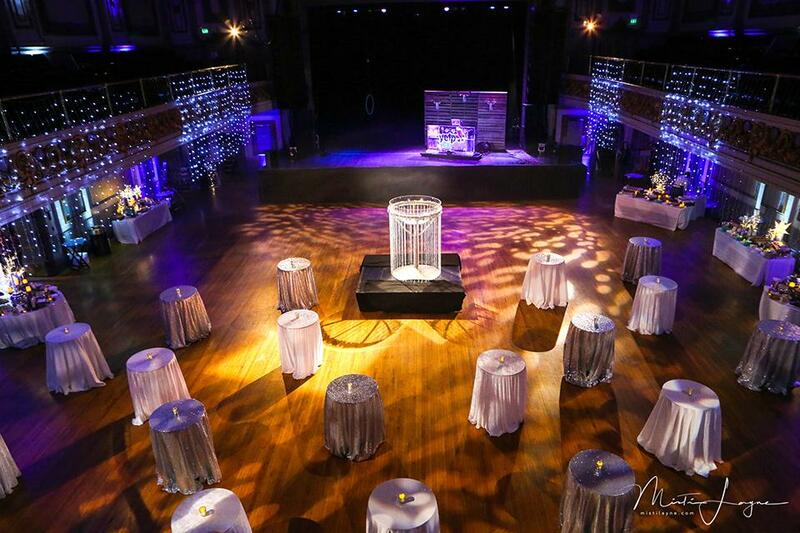 A versatile setting for any themed event or color palette with a 40ft built in bar, this room is perfect for both cocktail reception and main event. Sutter Room seats 300 guests with a dance floor, 350 without and can accommodate up to 600 for a standing reception. The Regency Ballroom is our largest room and a beaux-art treasure. Boasting thirty-five foot ceilings, twenty-two turn-of-the-century teardrop chandeliers, blonde hardwood floors, a horseshoe-shaped balcony and a built-in stage, this room is ideal for larger banquets and receptions featuring live entertainment, your guests will be humbled by this neoclassical marvel. You can comfortably seat 350 guests with a dance floor, 400 without and can accommodate up to 1400 guests for a standing reception.